Burro – Sebastopol, CA | Bull Terrier Rescue, Inc.
Burro is a 2.5yo guy who arrived with his friend, China, when their family had to move. He is great with children and other dogs but will gladly chase cats and other small furries. 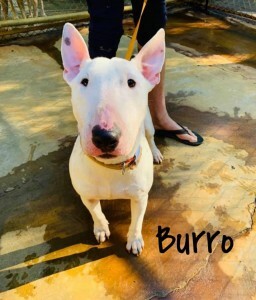 Burro is crate trained but will need a refresher on leash and house training. If your information is not yet on file, please complete our online application (http://www.bullterrierrescue.org/?page_id=572). Please contact Suz at suz@bullyhaven.org or 415-672-7391 if you have any questions about this sweet wonderful guy.